BoJack Horseman's Raphael Bob-Waksberg, interviewed. Back in the ’90s, he was in a very famous TV show. BoJack Horseman, Netflix’s animated series about a washed-up ’90s sitcom star living in the Hollywood Hills, is now in its fourth season. Its protagonist is half-horse, half-man, and its tone is half-jokes, half-existential-angst. That’s a study in contrasts that seems inexplicable—until you talk with the show’s creator, Raphael Bob-Waksberg. Bob-Waksberg is about as introspective, funny and dark as you can be at the tender age of 33. And in the latest episode of Studio 360, which recently joined the Slate empire, host Kurt Andersen talked to Bob-Waksberg. They covered a lot, like why so many people who go to Harvard are dummies, the genius of the film Who Framed Roger Rabbit? and the underappreciated poignancy of The Simpsons. 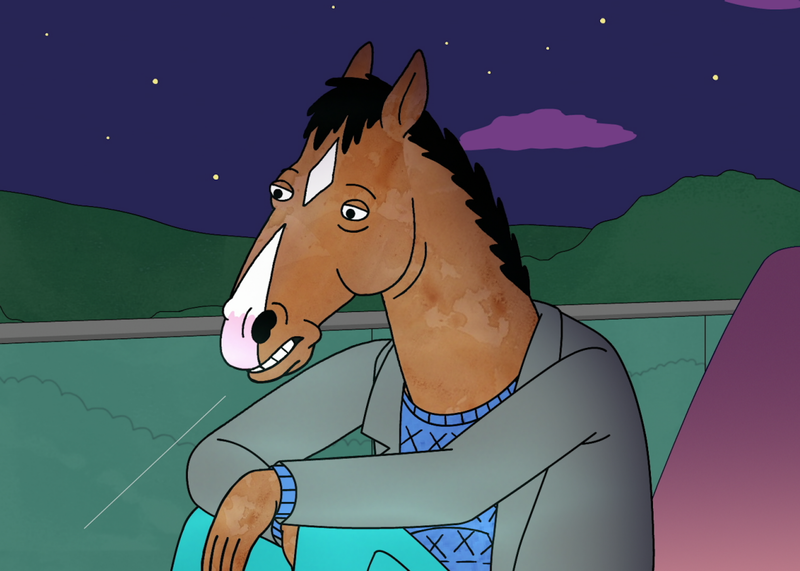 Kurt Andersen: BoJack Horseman is a dark comedy and the line on this fourth season is that it’s even darker. Is the appeal to you to use these goofy cartoon animals and humans and then deal with these real issues? Raphael Bob-Waksberg: In some ways it’s easier to talk about very serious issues through the lens of these wacky cartoon animals. And I think the show business setting kind of gives us that too because this industry is so over-the-top and outlandish. It allows us to comment on this real stuff in a way that perhaps if you were more straight ahead it would feel almost, like, afterschool special–ish or maudlin or indulgent. And with animal cartoon animals doing it you can get away with more. If it’s humans doing it live-action, you kind of don’t like those people. But when it’s a cute pink cat, it feels a little lighter—it doesn’t quite feel as heavy or as, frankly, evil. On the show you’ve had an obsessive attack on Harvard Lampoon. And as an alumnus of the Harvard Lampoon, I find all of that really funny. There is a mafia of them out there. Who Framed Roger Rabbit is one of my favorite movies of all time, and in fact it is maybe the first movie that I really loved in an adult way. Because I was, you know, only in middle school, but I would really say, “Oh this is this is my movie, and I really love it.” It affected so much about the way I see the world and experience the world. There’s a lot about comedy in that movie and Roger Rabbit talks about how powerful comedy is. For a long time in my adolescence, comedy was the only tool I had for communication and dealing with the world and dealing with people—I didn’t know any other lens in which to do it. Does that mean you had a problematic adolescence and you could only be happy by being funny? Well I think “problematic” might be overstating it but I had ADHD when I was a kid. I had behavioral problems. I didn’t always feel like I fit in. Which is somewhat universal. I don’t want to imply that I was like some super out-there kid. Of course on your list of influences is The Simpsons. Here’s a clip from the ’90s, when Homer discovers Marge is pregnant with baby Maggie. What I love about that clip specifically is it’s so funny but it is also grounded in a very real situation for this domestic family, right? This is a story about Homer, who finally gets his dream job and then realizes he can’t keep it because he needs to make more money because his wife is pregnant again, which is such a heartbreaking story on its face. But then they’re able to kind of festoon it with jokes in a way that doesn’t undercut it but actually makes it feel more powerful. So for me the biggest way The Simpsons influenced BoJack and my outlook on comedy they were able to tell sometimes sad stories in ways that didn’t sacrifice comedy and to tell funny stories in ways that didn’t sacrifice character and sacrifice the emotions. Mad Men is also on your list of shows that influenced you. Mad Men is not a comedy and but Don Draper is cynical. Is what you like about the show that Don Draper is kind of BoJack-y? That’s the generous way to put it—you might say is BoJack is kind of Don Draper-y. I think about, “What do I want my show to be?” And there’s a specific thing that Mad Men made me feel which is that it crawled inside of me and kind of wormed inside of me in ways that I did not understand. And it felt like magic. It wasn’t just that I liked it. It felt like it became a part of me while I was watching it. Another one of my favorite shows is Arrested Development, and I remember when that was on Fox, and it wasn’t doing well in the ratings, and it blew my mind. I couldn’t understand why everyone didn’t love this show that was so obviously brilliant. And Mad Men was the opposite: I couldn’t understand why other people loved it, because it felt so personal and so much a part of me and it spoke directly to me. It is like it ripped my ribcage open and just fed itself directly into my heart. And I think everyone felt that way. That’s what was so amazing about it: I’m not like Don Draper. Really, like none of the characters really spoke to me specifically or to my experience. But just something about the nakedness of the emotion and the vulnerability about it really kind of wedged its way in. And that is something that we do try to do on BoJack. I think we do succeed for some people in that some people feel like, “Oh my god, this show sees me or this show gets me and is inside me” in a way. And I don’t actually know how we do it. I don’t know what the practical steps are for making that other than knowing that is a thing that we aim for.